Citizens call for the removal of Kadena Air Base in front of Kadena’s Gate 1 in Chatan Town around 9:00 a.m. on April 28. 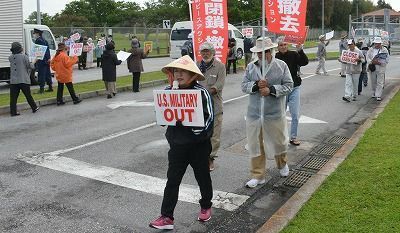 On the morning of April 28, the Kadena Peace Action group, which is demanding the closure and removal of Kadena Air Base, held a protest gathering in front of the base’s gates 1 through 5. Participants dedicated a minute a silence to the woman who went missing in Uruma City on April 28, 2016 exactly one year ago, and was later found to have been the victim of assault and murder by a U.S. serviceman.